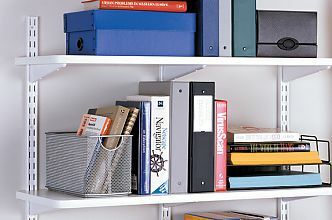 This strong, durable, adjustable shelving hardware has made KV famous. Reinforced brackets lock into the double-slotted standard (sold separately) for strong, secure weight-bearing support. Fully adjustable in 1-1/4 inch increments. Designed with access holes to attached shelves to brackets for extra safety. For use with the Knape and Vogt 82 Standards (sold separately). Brackets sold by the EACH.